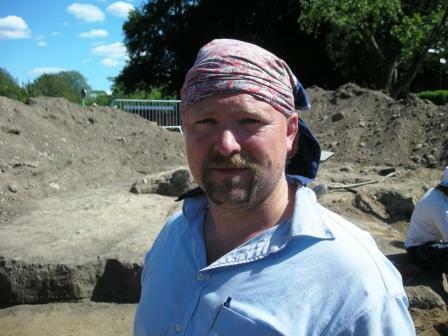 My name is Magnus Reuterdahl; I am a 37 years old Swedish archaeologist/osteologist residing in Stockholm and in Härnösand. If you follow this blog or if you read some of the older posts you’ll see that my work has taken me around most of Sweden and sometimes beyond. At present I’m employed at the county administrative board of Västernorrland. The last few years I worked at the county administrative board of Kronoberg and Norrbotten, at Norrbottens museum, for Kalmar County Museum and Östergötland County museum, Arkeologicentrum and Arkeologikonsult. I’m also part of the Yanhshao project – a projact that aims to leran more, and to shear that knowledege, about Chinese archaeology and the neolithic Yangshao traditions. As some of you may have noticed I have borrowed the name of this blog from Geoffrey Bibby´s book; The Testimony of the Spade – Life in Northern Europe from 15,000 B.C. to the Time of the Vikings. On the front page in the Swedish edition of the book there is a quotation: To Vibeke, whose question makes archaeology come alive: “How does it feel to be prehistoric?”. I think that question is part of what got me interested in archaeology. What was life like then? I have studied archaeology, osteoarchaeology (both human Osteology and Zooarchaeology), Scandinavian languages with a historical profile (Runes, the sagas, ancient Icelandic etc. ), cultural heritage and environment, laws and customs among other things at Stockholm University. In 2004 I got my master of arts in archaeology and osteoarchaeology, since then I been a working man. As timed passed my question may have become more precise and diverse as answers most often gives ground for new questions. But in the end the answer to most of those questions still in some way are connected with the original one: What was it like then? I also blog on wine, my other big interest in life at Aqua Vitae (in Swedish) and Testimony of a wine junkie (in English).